As a central and prominent structure of the face, your nose is a key defining element of your beauty. In fact, only a few of us would actually admit that we are 100% happy with the shape of our nose. For many people the thought of going under the knife is extremely scary, if you are apprehensive about surgery there may be a simple and quick, nonsurgical option for you. 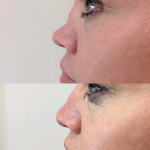 By using dermal fillers, our doctors can smooth out dents and bumps with results usually lasting 12-18 months. The filler is safely absorbed by the body over that time period. Price may vary following consultation but this is the usual amount payable. Avoid make-up for 24 hours to injected areas. If you must use this, please apply the iConceal or Oxygenetix medical foundation as it encourages the healing process.